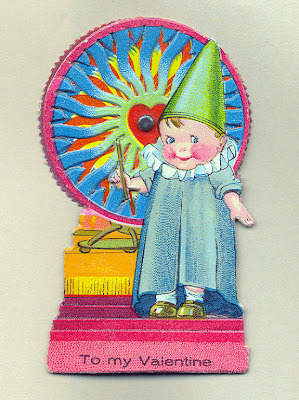 This itty bitty German valentine, just 3 1/4 inches tall and circa the late 'teens or early '20s, features a "spinner" that gives the effect of a flaming heart in the background. For some reason, the little boy appears to be dressed as a wizard. Very cool mechanical. Most I've seen just have an arm that waves up and down. I guess he's conjuring up some love. Very nice.